For the past two days my mind has been enammered by the thought of Jesus as my shepherd. The word gets tossed around so much in scriptures, it’s almost as if we say it and then move on with our thoughts, never truly understanding what all that means. Also, people don’t shepherd anymore, meaning it’s not a job your best friend does Monday through Friday. Could you imagine? It’s humourous to think about, but it makes sense that in 2010 we don’t automatically think of anything special when we hear the word SHEPHERD. However, in the years that Jesus was alive, this occupation was common! So common that you and your best friend either were shepherds or knew people who were. Therefore, in Jesus’ culture, this word carried meaning and depth. In 2010 how many of us can actually say we even know the specific tasks of a shepherd? Sure we are aware of the “watching over the sheep” and the “moving the sheep from point A to point B” parts, but what more do you know about what it takes to be a shepherd? I personally didn’t know much more until God reminded me of a sermon I heard a few months ago about shepherding. I remember being really shocked at what the occupation entailed, and even a little confused as to why I hadn’t known about it before. I am thankful that God reminded me yesterday, because I needed Jesus the SHEPHERD more than anything last night. My week has been a rough one. Yesterday was the epitome of difficult when it culminated in 9 phone calls to student’s parents concerning their behavior. Apparently I am being tried and challenged and tested and stretched, and might I add it doesn’t feel good! In addition, God put me on notice that I have prune a major part of my life very soon, and as tears streamed down my face (as I layed on the floor of my closet) all I could do was whisper the words to an excellent song: ” To worship you I live, To worship you I live; I live I live to worship you.” My heart felt broken last night, and I desperately needed comforting. In His infinite wisdom and provision, God did just that. In the sermon I heard a few months ago, the pastor mentioned some of the tasks of the shepherd. I wanted to learn more so I did some research of my own last night. What I found was astonishing, and began to warm my heart! We have all heard Psalm 23 before, and I am sure it has sounded sweet to you. As I am writing this I realize that the blanket I have from my grandfather’s funeral has this very psalm on it, and as I look at it everyday, I have yet to understand the magnitude of how the words effect me. I realize now that the part that gets me is “he anoints my head with oil,” which just sounds like it has holy implications to it, as it very well could. However, what really takes my breath away is the realization of how oil and the shepherd correlate. Sheep are often bothered by insects and injuries throughout the course of the day. At night, it is the job of the shepherd to tend to these injuries and take preventative measures against insect attacks and bites. He would take oil and literally massage the tender flesh, alleviating the pain and the infection. The shepherd would do this with EVERY sheep in his flock that needed tending to, and he wouldn’t sleep until the job was done. 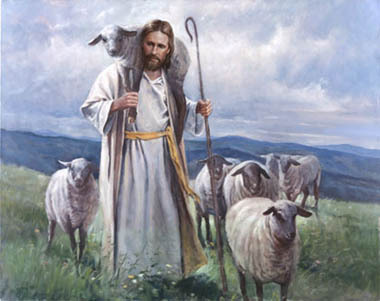 The shepherd has no other responsibility in the world at that moment than making sure his sheep were safe and healthy. Last night as I slept I ask God to tend to my wounds and I fell asleep literally imagining a shepherd anointing my injuries with oil. The peace the came with knowing I would awake completely fresh and completely cared for is indescribable. All of the attacks of the enemy, all of the lack, all of the pain in the world was literally washed off of me as I slept the my shepherd massaged my hurting parts. Tell me this isn’t some powerful stuff??! So tonight, I encourage you to speak to your shepherd, Jesus. Ask him to do the tasks He was born to do! Ask Him to tend to your injuries and heal you. Ask… and He will not fail you! this was wonderful! thank you for sharing! you made my day! God bless you for even taking the time out to post this up. Learnt a lot just now. God bless!